Prosthodontics is the dental specialty pertaining to the diagnosis, treatment, and maintenance of the oral function, comfort, and appearance of patients with conditions associated with missing or deficient teeth using biocompatible substitutes. Typical prosthodontic procedures include placement of implants, crowns, and dentures. 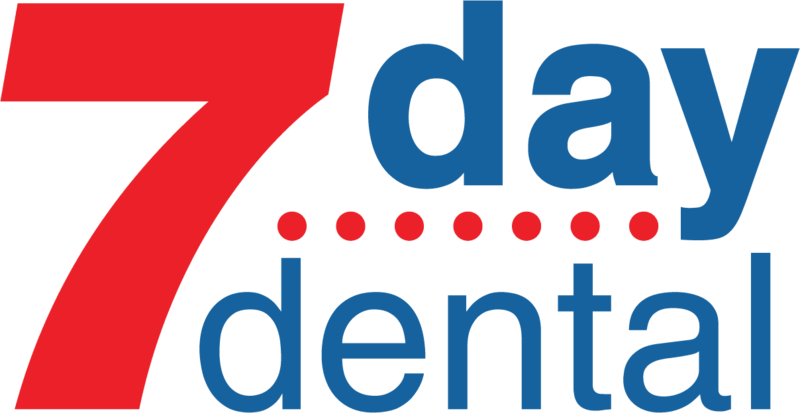 At 7 Day Dental, we have a state-of- the-art facility and employ the latest techniques to achieve the best results. We are proud of our prosthodontic team that has helped countless people have the smile they desire. Some of the prosthodontic services we offer are described below. At the end of this page are links to pages with additional information. Traditional dentures are removable dental appliances that serve as replacements for missing teeth. Teeth loss is usually due to gum disease, tooth decay or traumatic injury. Partial dentures are used when one or several teeth are missing in an arch. Full dentures are designed for people who have lost all their teeth in an arch. 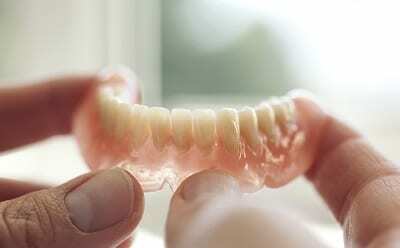 For full dentures, the replacement teeth are set into a gum-colored acrylic resin base. Originally, these were always removable, and the maxillary (upper) dentures included a part that covers the palate. While traditional removable dentures are preferable to missing teeth, advances in technology have resulted in further improvements. Implant anchored dentures are more comfortable and secure than conventional dentures and are easy to clean. There are two types, permanent and removable. With permanent dentures, several screw retentions are placed in the jaw and the dentures are permanently attached to them. This is the most stable form of denture. A removable implant anchored denture has an extra attachment on the screws that allows for dentures to be snapped in and out. A patient may have a few remaining teeth that must be removed before dentures are crafted. For a conventional denture, this means waiting until the gum tissues have fully healed, a process that typically takes four to six weeks. Meanwhile, the patient (you) will be without teeth. On the other hand, immediate dentures are made in advance and inserted right after the remaining teeth are removed. With this type of denture, you do not have to spend your waiting time without teeth. However, adjustments will be done to the denture when your gums fully heal. There are fixed (permanent) partial dentures and removable partial dentures. Traditional removable partial dentures use wires to hook them onto the permanent teeth on either side. These are less stable than the newer, implant-anchored type and have a tendency to move when the wearer chews food. Nowadays, most partial dentures are anchored with implants for a secure fit and protection of the bone structure. Metal-free partial dentures are another alternative. The flexible Valplast partial has a base is made from a flexible acrylic-like material that mimics the gingival tissue. They are typically more affordable than fixed restorations and only a bit more expensive than conventional dentures with visible metal clasps. Many people find these the most comfortable partial dentures, and the final restoration can be made quickly and precisely. Dentures enable you to achieve an appealing appearance. Over time, the absence of teeth may cause facial muscles to sag; consequently, this can make you look older. Dentures can improve your appearance, enable you to have a positive self-image and boost your confidence. It is important to note, however, that dentures offer more than just esthetic benefits. They can also help you eat efficiently, enabling you to chew your food properly. Studies have noted that not chewing food well can lead to digestive and other health issues. In addition, having missing teeth can make speaking properly challenging. Wearing dentures can alleviate the difficulties and make it possible for you to speak clearly. 7 Day Dental offers high quality partial and full dentures which are carefully crafted to meet your esthetic specifications and ensure your comfort. Furthermore, our dentures are durable; with proper care and by observing good oral habits, they can last a long time. When one or two teeth need to be replaced, most people choose to get a prosthetic known as an implant. This term is an abbreviation for a dental crown that sits atop an abutment affixed to a titanium post which is implanted in the jawbone. The procedure is done in stages. The initial surgery for placing the post is done using local or general anesthesia. The a patient must wait several months for the gums to heal and for new bone to develop in the jaw. Consequently, the entire restoration procedure usually takes three to eight months. Implants have many benefits when compared to dentures. They integrate into the structure of your own bone and prevent bone loss and gum recession. Implants function just like natural teeth, so you can eat all foods. You can’t misplace them, and you won’t have to deal with messy denture plates or adhesives. Furthermore, dental implants usually look even better than your natural teeth. A full mouth reconstruction, also called full mouth rehabilitation, refers to the process of restoring or rebuilding a mouth that is in a very poor state of health. Full mouth restoration may be needed where there are severely decayed teeth, extremely worn teeth from acid erosion or grinding, and fractured or broken teeth due to trauma. It also may be performed to alleviate persistent muscle, jaw and head pain as a consequence of a misaligned jaw. A full mouth restoration necessitates several dental procedures performed by dentists from different dental specialties. Also, the process involves multiple phases and may last for several months. It often includes tooth extraction; deep cleaning and periodontal care; reduction of natural teeth to prepare for crowns; crown lengthening, bone grafting; implants; and orthognathic (corrective jaw) surgery. Our 7 Day Dental specialists and dental practitioners deliver the highest quality of dental service. Competent and caring, their focus is not just to ensure a successful treatment but also to guarantee patient comfort throughout the treatment process. With our cutting edge equipment, highly skilled specialists and staff members and our countless satisfied patients, we are the office of choice when it comes to prosthodontic services in Orange County. Let us help you have the smile you desire!